The Vegas Golden Knights won this overtime Game 3 to capture the home ice advantage they lost Game 2. The Vegas Golden Knights who have fought back in many games all season long, did it again as they regained the home ice advantage they relinquished to the San Jose Sharks in Game 2. Overcoming a heart-breaking tying goal in the last two minutes by Tomas Hertl, the Golden Knights did what they do best... win. The San Jose Sharks sent the heavy artillery towards the Vegas goalie Marc-Andre Fleury firing 16 shots at him... and all for naught. Fleury was impossible to solve, as he has been in these playoffs so many times. He came up with numerous unbelievable saves again to pace his team and keep them in the running. This one stops a streaking Tomas Hertl in the first period to keep the game scoreless. Timo Meir scored the game's first goal at 6:59 on a power play juicy rebound off of a Mikkel Boedker shot. Meir had the entire right side of the net as Fleury had no chance to stop this shot as he was out of position attempting to block the slap shot by Boedker. The Vegas Golden Knights were not discouraged, as they went right to work and tied the game 2:41 later on a power play of their own by Colin Miller. James Neal found Miller backdoor and the game was tied 1-1. Jonathan Marchessault then proceeded to give his team the all important lead with yet another power play goal at 13:09. His missile like one-timer from the right faceoff circle was impossible to stop... and Martin Jones didn't have a prayer. As is so often when an NHL team has their opponent on the run, they try to finish them off. Leading 2-1, the best thing the Vegas club could do was score again... and that's exactly what they did. 1:17 after Marchaessault's missile, Reilly Smith joined the fun with a nifty deflection play on the right post. William Karlsson's deflection pass to Smith was a thing of beauty. The Golden Knights felt pretty good going into the locker room with a two-goal lead on the road. The Sharks who had to play Game 2 without their newly acquired forward Evander Kane came back at the 7:49 mark when Kane cut the Vegas lead in half. Brent Burns planted a perfect pass on Kane's stick and he knew what to do with it, as his whistling wrister evaded Fleury up high on the glove side. The Sharks were back to within a goal and went to work. They had to pull Martin Jones to get the tying goal when Hertl's dramatic tally at the 18:03 mark stunned the confident Golden Knights. Hertl attempted a stuff shot in close, was denied but stayed planted in front of the net. His patience was rewarded as he was able to get the tying goal by Fleury. 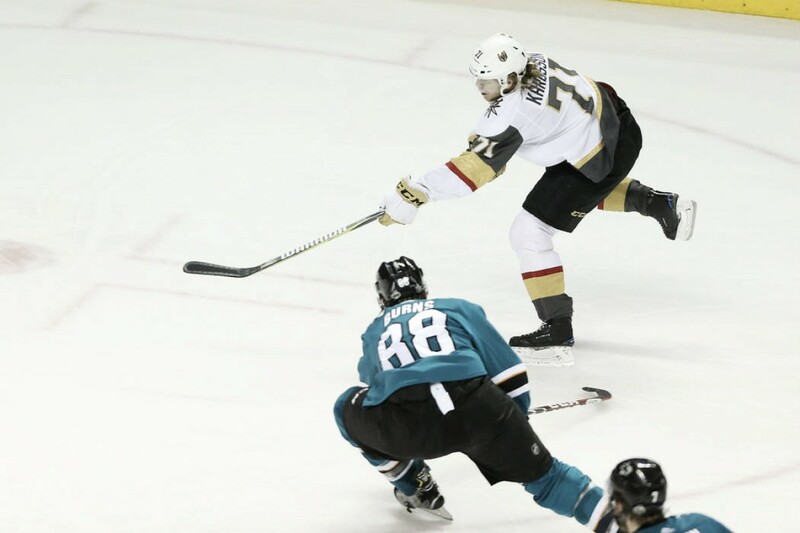 The contest went into overtime for the second straight time until at the 8:17 mark Karlsson scored the winning goal to ruin the courageous comeback mounted by the Bay area Sharks. William Karlsson has been unstoppable in this series with three goals, and four assists. If San Jose can't determine what to do to stop him this series could be over quicker than a ride on BART for the Sharks. Here's Karlsson's winning goal as he put it in fifth gear and motored past the defense letting go his high drive past Jones to give the Golden Knights a 2-1 game lead going into Game 4 Wednesday night in the Shark tank. Can the San Jose Sharks get back in this series, or better yet can they stop the offensive dynamo William Karlsson from sending them to the golf course? Let us know in the comments section below.